Nicholasville is a 2nd-class city in Jessamine County, Kentucky, in the United States. It is the seat of its county. The population was 28,015 during the 2010 U.S. Census, making Nicholasville the 11th-largest settlement in the state. The city serves as both a residential area for Lexington-area commuters and as an employment and shopping center for central Kentucky. 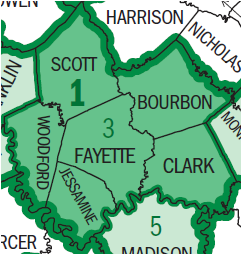 Nicholasville is located at 37°52′58″N 84°34′36″W﻿ / ﻿37.882670, -84.576585 (37.882670, -84.576585). According to the United States Census Bureau, the city has a total area of 13.08 square miles (33.9 km2), of which 13.01 square miles (33.7 km2) is land and 0.07 square miles (0.18 km2), or 0.52%, is water. Nicholasville was founded in 1798. It was, however, not formally incorporated until 1837. The town was named in honor of Colonel George Nicholas, a father of the Kentucky constitution in 1792. The Young House in Nicholasville is listed on the National Register of Historic Places. As of the 2010 census, there were 28,015 people, 10,492 households, and 7,503 families residing in the city. The population density was 2,141.9 per square mile (827.0 /km2). There were 11,405 housing units at an average density of 872.0 per square mile (336.7 /km2). The racial makeup of the city was 91.5% White (89.5% non-Hispanic), 4.3% African American, 0.2% Native American, 0.5% Asian, 0.1% Pacific Islander, 1.2% from other races, and 2.3% from two or more races. Hispanics or Latinos of any race were 3.5% of the population. There were 10,492 households out of which 36.4% had children under the age of 18 living with them, 49.2% were married couples living together, 16.7% had a female householder with no husband present, 5.6% had a male householder with no wife present, and 26.5% were non-families. 22.3% of all households were made up of individuals and 7.4% had someone living alone who was 65 years of age or older. The average household size was 2.64 and the average family size was 3.07. The age distribution was 27.9% under the age of 18, 8.8% from 18 to 24, 30.7% from 25 to 44, 22.8% from 45 to 64, and 9.8% who were 65 years of age or older. The median age was 33.1 years. For every 100 females there were 91.1 males. For every 100 females age 18 and over, there were 86.9 males. According to Census Bureau data for 2011 (American Community Survey 5-year estimates), the median income for a household in the city was $43,453, and the median income for a family was $52,419. Full-time male workers had a median income of $37,954 versus $33,330 for females. The per capita income for the city was $19,526. About 14.5% of families and 17.1% of the population were below the poverty line, including 22.7% of those under age 18 and 6.5% of those age 65 or over. U.S. Route 27 is a major north-south artery. From the Lexington city limits to the Business US 27 intersection north of the city center; it is a four-lane arterial highway with a center-turning lane. US 27 diverts to the western edge of the city center on a four-lane, controlled-access bypass and continues south of the city towards the Kentucky River. Construction began on the $16 million, 6-mile (9.7 km) Nicholasville bypass in March 1986. The four-lane, controlled-access bypass opened in 1988. It has seven at-grade intersections and one diamond interchange. Business US 27 is a variable two and four-lane arterial route running north to south of the downtown, concluding at US 27 at both terminus's. Kentucky Route 29 is an east-west two-lane highway that stretches from the western fringes of the city west of the US 27 bypass to Business US 27 in downtown Nicholasville. It is known as Wilmore Road, west of US 27 and east of Maple Street. Kentucky Route 39 is a north-south highway that stretches from the farms south of the city before concluding at Business US 27 at downtown. It is known as Maple Street, and as Sulphur Well Road and then Lancaster Road. Kentucky Route 169 is an east-west highway that cuts through the city center. It has intersections with US 27 and Business US 27. It is known as Keene Road, northwest of the city center, then 3rd Street, Richmond Road and Union Mills Road on the east side. Kentucky Route 1980 is known as Ash Grove Road and travels into Fayette County to the east. It departs from US 27 just south of the Lexington city limits. Kentucky Route 3375 traverses west of US 27, north of the city center, and is known as Catnip Hill Road. A new 7.4-mile (11.9 km) four-lane divided highway running from a Single-point urban interchange at US 27 north of Nicholasville to US 27 south of Nicholasville is being designed to serve the eastern half of Jessamine County's county seat. The western Nicholasville bypass, signed as US 27, was completed in 1986 with an interchange at KY 29 and a few at-grade intersections. The eastern bypass of Nicholasville will give commuters another option of bypassing the city, while serving the residents of the eastern half of Jessamine county. In September 2002, the Federal Highway Administration approved an environmental assessment document. Right-of-way purchase, estimated at $15 million, began in 2006, with relocation of utility lines in 2007 and construction in 2008. It was to be completed in 2010 at a cost of $73 million to complete. The Kentucky Transportation Cabinet predicts that when the highway opens, 58,000 travelers will use the western bypass and 45,000 will use the eastern bypass. ^ a b Commonwealth of Kentucky. Office of the Secretary of State. Land Office. "Nicholasville, Kentucky". Accessed 15 September 2013. ^ Columbia-Lipincott Gazeteer, p. 1320. Columbia Univ. Press (New York), 1952. ^ Federal Writers' Project (1996). The WPA Guide to Kentucky. University Press of Kentucky. pp. 254. http://books.google.com/books?id=IuGCoLRCN-kC&lpg=PP1&pg=PA254#v=onepage&q&f=false. Retrieved 24 November 2013. ^ a b Honeycutt, Valarie. "LEXINGTON TO GET $24 MILLION FOR ROADS STATE TO HELP CITY LAUNCH MORE THAN A DOZEN PROJECTS." Herald-Leader [Lexington] 5 Sept. 1986. 10 Jan. 2007. This page uses content from the English language Wikipedia. The original content was at Nicholasville, Kentucky. The list of authors can be seen in the page history. As with this Familypedia wiki, the content of Wikipedia is available under the Creative Commons License.